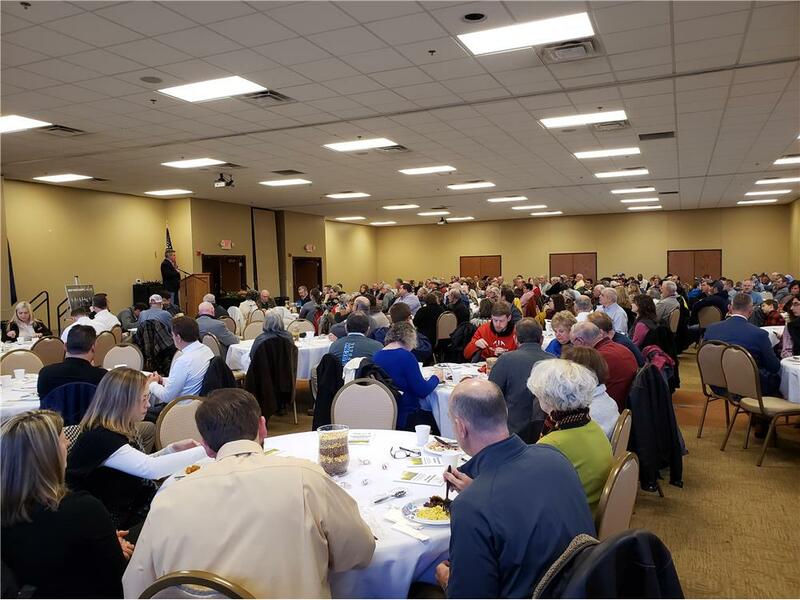 The icy cold morning of Jan. 30 didn’t stop approximately 230 Logan Countians in attendance at the annual Agriculture Appreciation Breakfast! Hosted by the Logan County Chamber of Commerce in partnership with the Logan County Extension Office, we came together to celebrate agriculture with a free breakfast of Cattlemen’s ribeye steak as well as eggs, biscuits, tater tots and gravy provided by Colonial Inn Restaurant. This year our guest speaker was Kentucky Agriculture Commissioner Ryan Quarles who expressed his great love and faith in Logan County and Kentucky’s agriculture. He also spoke on topics such as coming from a farm family himself to the future of agriculture with Kentucky standing at the forefront in innovation. A wide array of sponsors made the event a huge success with several of them on hand, showcasing what they offer to make the lives easier for those in the agricultural community. Congratulations to Farm Credit Mid America for winning the country ham auction that will benefit Logan County 4-H and send kids to camp this summer at a reduced rate. The local FFA students were on hand to help serve as well. We’d like to thank our sponsors; H&R Agri-Power, H&H Sheetmetal, Champion Petfoods, Haley Realty & Auction, BB&T Bank, Hutson, Inc., Southern States Coop, Hopkinsville Elevator, Farm Credit Mid-America, Lewisburg Banking Company, Logan County Farm Bureau, Russellville Glass Company, Darling Ingredients, Moore Insurance, Logan Orthopaedics, Logan General Surgery, RJ Corman Railroad, Carr, Riggs & Ingram, Auburn Bank, Keith Batchelor-Edward Jones, Logan Telephone Coop, Logan County Conservation Districts, Danny Coffey, Security Seed, Robert L. Blackford Real Estate & Auction, and Max Arnold & Sons. Also, thanks to the Logan County Jail for providing inmates to set up and take down tables and chairs at the event. We look forward to seeing you all again at our next event!